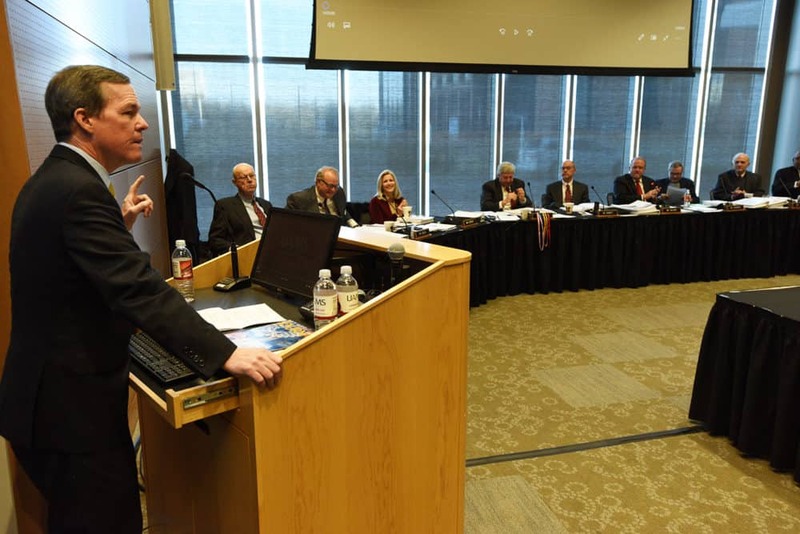 Chancellor Cam Patterson, M.D., MBA, gives the University of Arkansas Board of Trustees an update on UAMS' finances and programs during a Jan. 31 meeting. 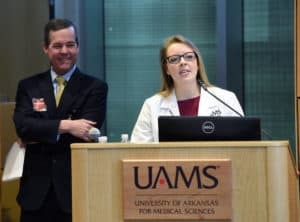 Feb. 7, 2019 | Chancellor Cam Patterson, M.D., MBA, gave the University of Arkansas Board of Trustees an update Jan. 31 on the future of UAMS, focusing on the improved financial outlook and efforts to secure National Cancer Institute (NCI) designation for the Winthrop P. Rockefeller Cancer Institute. Patterson reminded the board that in July 2018 UAMS presented its first balanced budget in at least five years. He said he was pleased to report that as of December 2018, UAMS was $8 million ahead of budget. Paula McClain, a first-year student in the College of Medicine, speaks to the Board of Trustees as Chancellor Cam Patterson looks on. 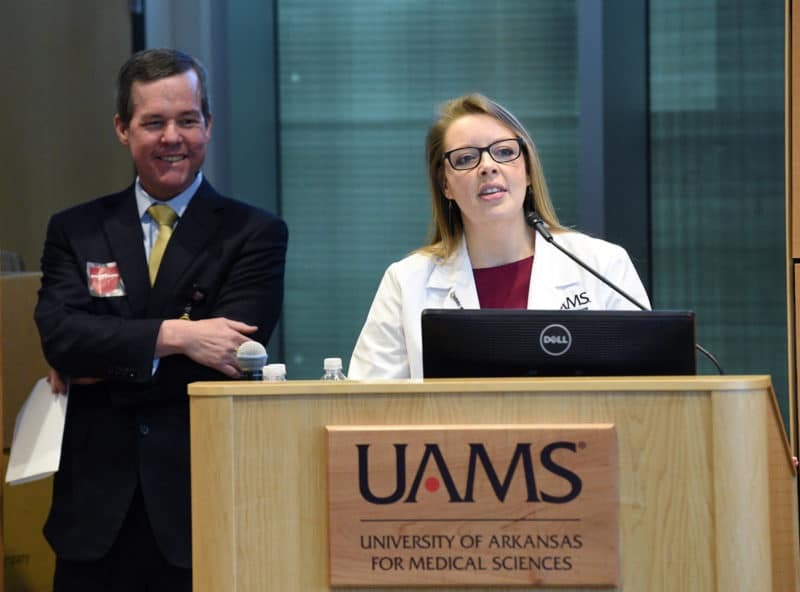 Patterson praised the efforts of Arkansas legislators to support UAMS’ efforts to achieve NCI designation, specifically noting the Republican Women’s Legislative Caucus’ Dream Big Initiative. He noted there are 70 NCI-Designated Cancer Centers in 36 states and the District of Columbia that form the backbone of NCI’s programs for studying and controlling cancer. However, none of those centers are located in Arkansas. About 68 percent of the funds awarded by the National Cancer Institute for research and clinical trials goes to NCI-designated centers. Centers without such designation must compete for the other 32 percent. Additionally, many NCI community outreach and program grants are only available to NCI-designated cancer centers. The chancellor also announced the formation of the Institute for Digital Health and Healthcare Innovation, led by Curtis Lowery, M.D., formerly chair of the Department of Obstetrics and Gynecology in the College of Medicine and medical director for the UAMS Center for Distance Health. Ashton Cheatham, a third-year student in the College of Pharmacy, tells the Board of Trustees why he chose UAMS for his education and how his experiences here have benefited him. Patterson told the board that growth at the regional campuses is another priority. The majority of family practice physicians in rural areas of the state are trained at one of UAMS’ eight regional campuses. “Eight is simply not enough,” he said, adding that he would like to see a total of 15 regional campuses operating in Arkansas. He applauded the growth at the Northwest Regional Campus, noting the accreditation of the Doctor of Physical Therapy program and the Internal Medicine Residency program. He also thanked the Schmeiding Foundation for the gift of the building that houses the UAMS Schmieding Center for Senior Health and Education. Patterson wrapped up his presentation by showing a short video highlighting various UAMS programs. 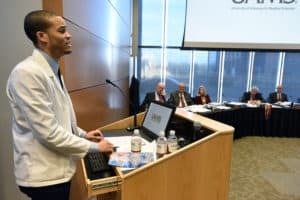 He then introduced two students — Paula McClain from the College of Medicine and Ashton Cheatham from the College of Pharmacy — to speak to the board about their experiences as UAMS students. McClain, a first-year medical student from Forrest City who previously taught science in middle and high school for several years, is serving as the class president, or “Class Mom” as she jokingly called the job. Her earliest exposure to the medical field came when she was 15 and her younger brother was born with Down syndrome and congenital heart defects. He was treated at Arkansas Children’s Hospital. “Instantly, I was just in awe of what physicians can do,” she said. Cheatham is a third-year pharmacy student from Pine Bluff who said he chose pharmacy because he liked chemistry, and his sister said pharmacists use a lot of chemistry. He came to UAMS in no small part because of his experiences in high school with UAMS Pharmacy Camp, a summer immersion program for seniors and recent high school graduates. “I am glad that I have been able to have my educational experiences in my home state, in close proximity to my home town and my support group,” said Cheatham.